Do you live in Pietermaritzburg? TOKYO - A powerful tsunami spawned by the largest earthquake in Japan's recorded history slammed the eastern coast Friday, sweeping away boats, cars, homes and people as widespread fires burned out of control. Authorities said at least 32 people were killed. The magnitude 8.9 offshore quake was followed by at least 19 aftershocks, most of them of more than magnitude 6.0. 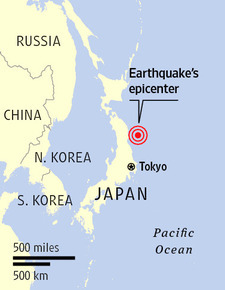 Dozens of cities and villages along a 1,300-mile (2,100-kilometer) stretch of coastline were shaken by violent tremors that reached as far away as Tokyo, hundreds of miles (kilometers) from the epicenter. A utility company in northeastern Japan reported a fire in a turbine building of nuclear power plant. A tsunami warning was issued for the entire Pacific, including areas as far away as South America, the entire U.S. West Coast, Canada and Alaska. Japan's Fire and Disaster Management Agency said at least 32 people were killed. "The earthquake has caused major damage in broad areas in northern Japan," Prime Minister Naoto Kan said at a news conference. Even for a country used to earthquakes, this one was of horrific proportions. It unleashed a 23-foot (7-meter) tsunami that swept boats, cars, buildings and tons of debris miles inland. Large fishing boats and other sea vessels rode high waves into the cities, slamming against overpasses. Upturned and partially submerged vehicles were seen bobbing in the water. Waves of muddy waters swept over farmland near the city of Sendai, carrying buildings, some on fire, inland as cars attempted to drive away. Sendai airport, north of Tokyo, was inundated with cars, trucks, buses and thick mud deposited over its runways. Fires spread through a section of the city, public broadcaster NHK reported. The tsunami roared over embankments, washing cars, houses and farm equipment inland before reversing directions and carrying them out to sea. Flames shot from some of the houses, probably because of burst gas pipes. Author has 24 articles online. LUCI HANGS UP HER MIC. 10TH COURSE FOR DOMESTIC WORKERS AT HIRSCH’S PMB. SOUTH AFRICAN BUSINESS WOMAN OF THE YEAR INSPIRES LOCAL BUSINESS WOMEN.